Larger Project 4-5, Kitchen » Roger Perron Inc. This kitchen view shows the honey-stained fir cabinets with built-in breakfast nook. The kitchen windows face the ocean view. 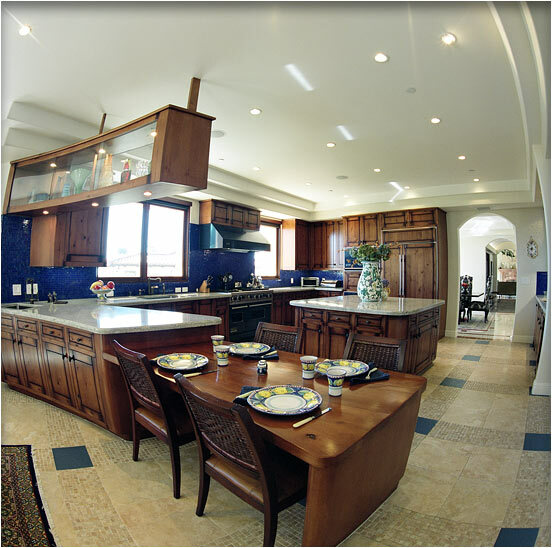 The backsplash is cobalt blue glass mosaic tiles and the counters are granite. The floor tiles are a combination of mosaic and stone. The suspended upper cabinet is curved with sliding glass panels. You can see the dining room beyond, and the living room is at the very end of the view.